HCR-8 hydraulic drilling rig an up-to-date multifunctional product made by our factory, is a thoroughly new-type wireline core drilling rig developed on the basis of the market demand and the advanced techniques in the world. This HCR-8 wireline core drilling rig is suitable to use in plains, hills, high temperature as well as low temperature places. The main machine is integrated in structure, which consists of self-propelled chassis, power, mud pump and hoist, etc. It is wire-line coring, and at the same time has the unique top drive function. The maximum torque is 7200 Nm (5307 lbf ft), which will be much more suitable for large diameter drilling in coal bed methane (CBM), hydrology and water well. According to many years of experience in HDD field, our engineers install clamp and shackle device on the rig to relieve labor intensity, improve drilling efficiency and guarantee operator's safety. HCR-8 wireline core drilling rig is excellent in performance, high in working efficiency, easy for operation and keeps the operators from dangers. Developed on the basis of HYDX series rigs, HCR-8 truck-mounted core drill rig is an up-to-date and thoroughly new-typed drilling rig. 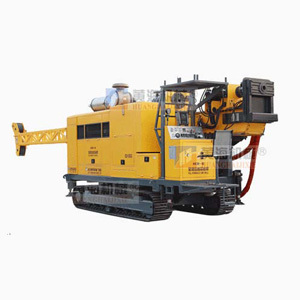 This hydraulic core drilling rig is an ideal core drilling machine due to reasonable design, compact structure, excellent performance, easy operation, convenient maintenance, and so on. Therefore, this machine can be used to different construction sites, such as plains, hills, high temperature as well as low temperature places. 1. 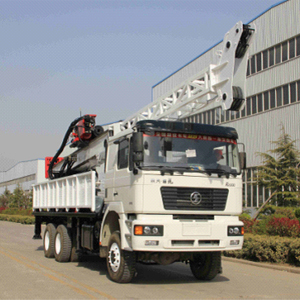 The full hydraulic driving system of the rotary drilling rig is mounted on heavy-duty truck. 2. This truck-mounted core drill rig adopts mechanical 3-gear speed regulation as well as hydraulic stepless speed regulation. 3. The oil cylinder is working with a feed-in multiple-speed chain, thus, its feed-in and lifting performances are stable and reliable. 4. With the mast being erected and lowered with oil cylinder, it is foldable and has moving and ground-supporting functions. 5. The mast is adjustable in the range from 0° to 90° to ensure a proper hole-drilling angle. The low gravity center of the rig promises a steady operation. And the control panel provides the operators with a convenient and comfortable working circumstance and a wide view.